We are in August and the valley is showing signs of spring. Orchards are changing from stark monochrome to soft patches of pink and white in the landscape. It always makes my heart skip to see the first promises of life and the realisation that spring is around the corner. The big Almond tree next to the road on the R317 is an explosion of white in the late afternoon and driving past it I could even smell the memory of its scent as I remember photographing it last year. It reminds me of a project in Primary School, when we had to make pictures of trees with blossoms. After taking the dark brown crayon and drawing my idea of a tree with lots of branches, I took bits of cotton wool and glued them all over the empty brown branches. The blossoms on my wax crayon tree were white and fluffy. And this is what the white blossoms on this old tree reminds me of, looking white and fluffy in the fading light. On our arrival home, we were greeted by some bright yellow daffodils next to the cellar window. These are the first daffodils in the garden. 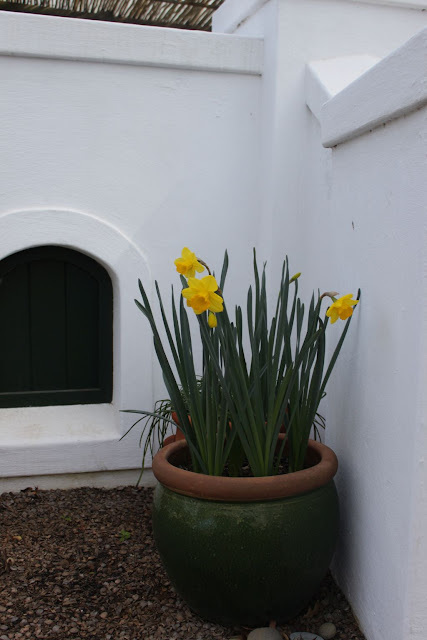 Although I love daffodils, they are a luxury that did not fit into the design scheme of an edible garden. The approach to the design of the garden was that every plant should be edible or be usable for something in, and around the house. When some plant pots became unused in the town garden, I decided to take them to Towerwater and plant different bulbs in them for fun. 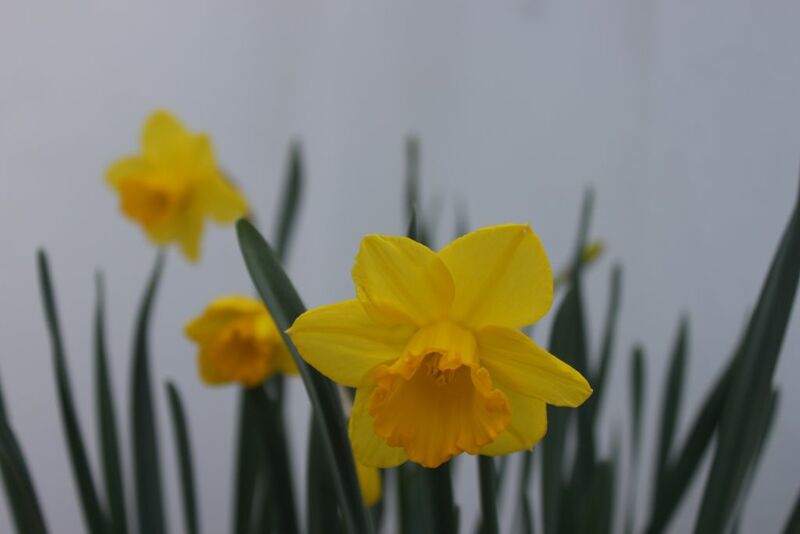 I would have loved to have a field of daffodils but for now I bought 20 bulbs of which 15 came up and 13 are flowering. 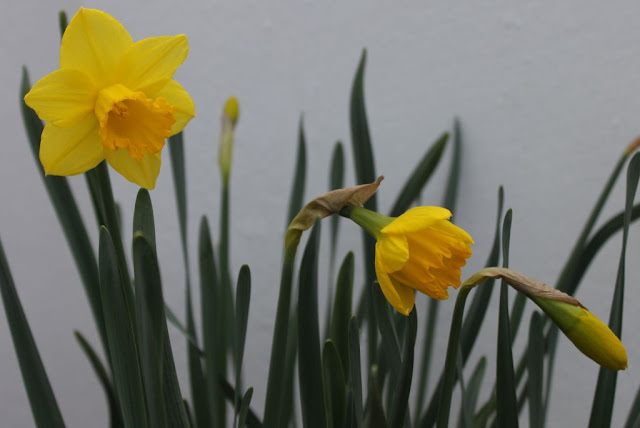 The luxury of having daffodils is still new, and that explains my counting and monitoring so closely. 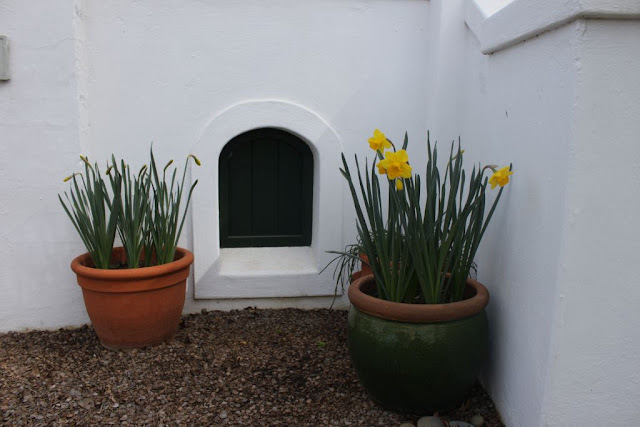 I hope they will multiply in time and become pots filled with yellow daffodil pleasure. For now I will enjoy each one as they open and treasure their survival into full bloom. I love Wordsworth’s poems, and “I wandered lonely as a cloud”, has always been a favourite. Years ago, when I visited the Lake District in England, I had the pleasure of seeing the fields of daffodils described in his poem that he wrote in 1804.